Posted on May 19, 2017 by Peter S.
My great-grandfather owned and operated a small dairy farm in Vermont, and so I grew up hearing stories about dairy cows. His father before him had owned the farm, and so he grew up milking, feeding, and otherwise tending the dozen or so cows they kept at any given time. Through all this, he apparently got to know these cows very, very well—the way a sommelier knows their wine, the way a falconer knows their birds. He would, of course, drink their milk every day, and would amaze my grandmother by drinking a glass and saying things like “Buttercup’s in a good mood today,” or “Dandelion’s been out in the brambles, you should check her for ticks.” According to my grandmother, the old man’s milk-sense was never, ever wrong. If you gave him a cup of Ballerina’s milk and told him it was Bluebird’s, he’d take one look at it, then tell you-you were a liar. The man knew his milk. Dairy farming isn’t the same as it used to be. 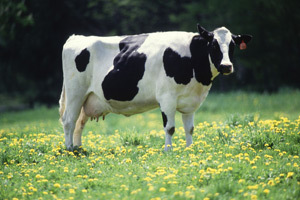 There aren’t many dairy farmers left who can tell the cow from the milk. But what hasn’t changed is that a good look at a glass of milk can tell a person a great deal about that milk’s properties. Food safety regulations have proliferated prodigiously since my great-grandfather’s time. As a result, putting milk to the test isn’t just a farmer’s pastime anymore. It’s an essential element of the quality control processes of any milk producer. The color of milk is important to producers for a number of reasons. Most directly, milk color is an important factor in consumer’s buying decisions. If a milk appears unusually colored to a customer, they will likely conclude that something has gone wrong with it and choose a different carton. This, then, becomes a question of brand identity as well. Customers who notice off-color milk from a specific brand will be less likely to purchase from the same producer at a later date. One bad carton of milk can have a ripple effect, disturbing a producer’s sales on an ongoing basis. Furthermore, discolored milk is indicative of age and spoilage1. As milk sits in storage, even at refrigerator temperatures, psychrotrophic bacteria that survived pasteurization can multiply and spoil the milk. Color can also indicate acidification2 of stored milk, as well as the effects of light-induced oxidation. Severe cases of discoloration can be detected by the naked eye. Moderate discoloration can be detected by the trained eye, like my great-grandfather’s. The beginning stages of discoloration are subtle enough to go unnoticed until the spoilage has become more advanced. No matter what the stage, human observation is subjective. This poses difficulties when creating scales and standards to assess the changes in milk color. As a result, many milk producers have turned to spectrophotometers. These color measurement instruments can quickly and accurately identify a milk sample’s color. Then they assign it a numerical value that can be repeatedly compared to an established standard or other samples. This allows for a greater level of control over the quality of milk products. Even companies operating facilities on opposite ends of the country can be certain their milk all measures up to the same, established standard. While many methods of spectroscopy exist—raman, NIR, and transmission, to name a few—the milk’s color can be verified with one of the simplest: reflectance. Exactly like it sounds, a reflectance spectrophotometer bounces light off an opaque liquid (or solid) and measures the wavelengths of the light that is reflected back. Doing so permits an operator to observe color on many scales, including CIE L*a*b*. Milk samples measured this way can be compared to pre-programmed standards. This allows operators to quickly and simply discover any deviations from the appropriate color. With over six decades of experience developing reflectance spectrophotometers to measure opaque liquids, HunterLab has honed its products to precisely match the needs of milk producers. Not only do our instruments generate fast, accurate measurement results, our sample holders are designed to accommodate your vials and cuvettes. To learn more about how spectrophotometers can help milk producers keep their milk up to standard, contact our friendly, professional sales force today. This entry was posted in Color in Food Industry and tagged color consistency, color measurement, colorimetry, milk, spectrophotometers, spectrophotometry. Bookmark the permalink.